We receive scanned copies of EOBs (Explanation of Benefits) and checks from the client through an FTP site in '.tif' format. The files are downloaded from the FTP site by our Medical Billing Team and allocated to the appropriate Payment Posting Team. Payment Posting team enters details such as patient account number, billed amount, allowed amount, adjusted amount, paid amount, and denial details into the billing system. For partial payments, analysis is done and corrective action is taken. 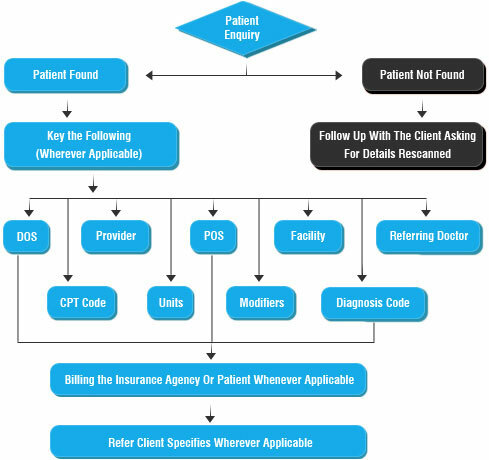 Our billing resources with substantial experience in the U.S healthcare industry, analyze the EOBs and the claims and take the necessary actions to recover the due amount. On receiving feedback on quality from the Client, we work towards the improvement and refinement of the Medical Billing Process in order to provide the most accurate and reliable services. Do you require high quality, customized medical billing services? Why not consider outsourcing to O2I? Read more specific information about infrastructure, competency, price ranges, and benefits. If you would like to find out more about outsourcing medical billing services to O2I, please fill in the inquiry form and our Client Engagement Team will contact you within 24 hours.